Ramat HaNegev, Israel is Jewish Nevada’s partner community. Ramat HaNegev and Jewish Nevada have partnered together to build connections and create authentic cultural experiences in Nevada and in Israel. The Bachman Young Leadership Ramat HaNegev Delegation is a program that aims to deepen the connection between emerging and existing leaders in the Jewish communities here in Nevada and in Ramat HaNegev, Israel. 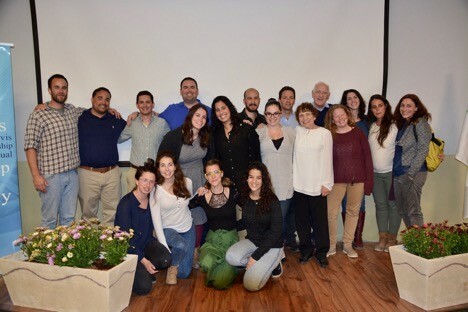 Through group travel in Jewish Nevada’s partnership region, these Young Leaders will deepen their Jewish identity, while inspiring participants to connect more deeply to Jewish Nevada’s work in Israel, and specifically in Ramat HaNegev. The program will provide leadership development, Israel education, and the opportunity to learn with a cohort of Israelis from our partnership region in Ramat HaNegev. This 10-day trip to Israel is designed for 6-8 emerging and current leaders between the ages of 25-40. Details to apply for the upcoming third cohort traveling to Israel in March 2018 are at the end of article. This past year’s delegation consisted of five participants, Ben Wegener, Danielle Rubinstein, Josh Millan, Joey Reyes, and Nicky Watts and was staffed by Jewish Nevada Director, Planning & Community Impact, Julia Franks. The delegation took place from March 18-29 and spent five days in our partnership region of Ramat HaNegev visiting the region’s Agriculture Research and Development Center, Nitzana, the MOP, and Holot. During the visit the delegation members, accompanied by young adults from Ramat HaNegev, met with residents from the regional council, toured historic sites, visited local businesses, learned about social projects in the area and were privy to the dilemmas and conflicts experienced by the residents. "First and foremost I would like to thank Jewish Nevada for the experience of my life. As a convert to Judaism this trip brought me closer to and increased my understanding of the Jewish faith and its people. I am forever grateful for this experience. Joey Being able to take a dip into the Mikveh in Ein Akev and reciting a prayer was divine. The partnership we have with Ramat HaNegev is vital.” Reyes stated, “We as a Jewish community here in Las Vegas need to continue to grow and nurture this relationship. I have so much to say but I will close with this, Israel is forever in my heart and I will defend it until my last days on earth. Thank you to all involved for making this delegation trip a success." The delegation also visited the newly built Sports Center, funded by Alan and Judy Bachman, and attended the sixth annual Davis Family Scholarship Ceremony on March 23. The Davis Family Scholarship program has been generously providing scholarships to students in the Ramat HaNegev region for several years. More than 120 students participated in this year’s ceremony. The ceremony was also attended by Jewish Nevada CEO Todd Polikoff, incoming regional council CEO Eran Doron, council representatives, young leaders in the community from Nevada and the region, and the Davis family, whose generous contributions, donations and involvement in Ramat HaNegev’s development go far above and beyond fostering the advancement of the education of the residents of Ramat HaNegev. • You will contribute $500 to the Campaign for Jewish Needs above and beyond your typical annual gift. Contact Megan Weintraub at Megan@jewishnevada.org to learn more on how to join us on our next delegation.